It's hard not to sing "...all about that bass, 'bout that bass" when I'm prepping my lids for an intense eyeshadow application. I'm surprised at how many clients don't use primer on their eyelids, yet they don't know why their eyeshadow creases, fades too quickly, or doesn't look like it does in that inspiration picture from Pinterest they are trying to copy. So I tell them they need to be all about that bass (in this case, base)- meaning they need to use an eyeshadow primer like NARS 'Pro Prime' or E.L.F. Shadow Lock and if they want to take it one step further- add a base such as NYX 'Milk' or 'Black Bean'. The picture above is a good example of the different ways eyeshadow will look, depending on what kind of base is used, or isn't. I'm using a very cool, $4 product from Milani Cosmetics. This shadow is extremely pigmented already and if you apply it wet with a flat brush, it makes a gorgeous eyeliner as well! Ok back to business...the swatch on the left has a white base underneath so it pulls the lighter undertones out from the shadow for a lighter, yet intense application. 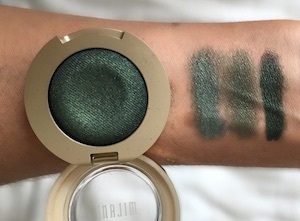 The middle swatch has no base underneath, giving it the most sheer look while still being very present. Finally, the swatch to the right is over a black base, which pulls it's deeper tones out for more depth and dimension. I chose the black base since it's Fall, which will give me that rich jewel tone application this season is known for. And yes, in Southern California we don't have seasons and can wear sleveless tops year round. Anyway, I often take inspiration for looks from beauty campaign ads and in this case it was Chanel's 'Blue Rhythm de Chanel' collection. If you look closely, the model has a dark base under her eyeshadow. A few coats of mascara were added for the right amount of definition and the rest of the makeup is kept neutral so the eyeshadow remains the star of the show. Want to learn how to achieve a look similar to this, step-by-step? Book a Private Makeup Assessment or learn in a fun social environment with your BFFs by hosting a Cosmetics & Cocktails party. Contact me for more info or to book!